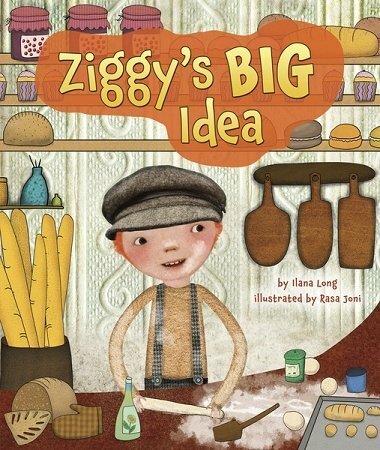 Ziggy’s Big Idea written by Ilana Long and illustrated by Rasa Joni (Kar-Ben Publishing; 2014; $17.95; Ages 5-9) is reviewed today by Rita Zobayan. I like bagels, especially mixed orange and cranberry, but I don’t know anything about them really. Ziggy’s BIG Idea by Ilana Long with illustrations by Rasa Joni, Kar-Ben Publishing, 2014. Ziggy’s Big Idea presents one interpretation of the bagel’s origin. Ziggy is an inventive young boy, full of ideas, such as a square ball that doesn’t roll into the street. However, his ideas don’t always work out quite as Ziggy hopes. 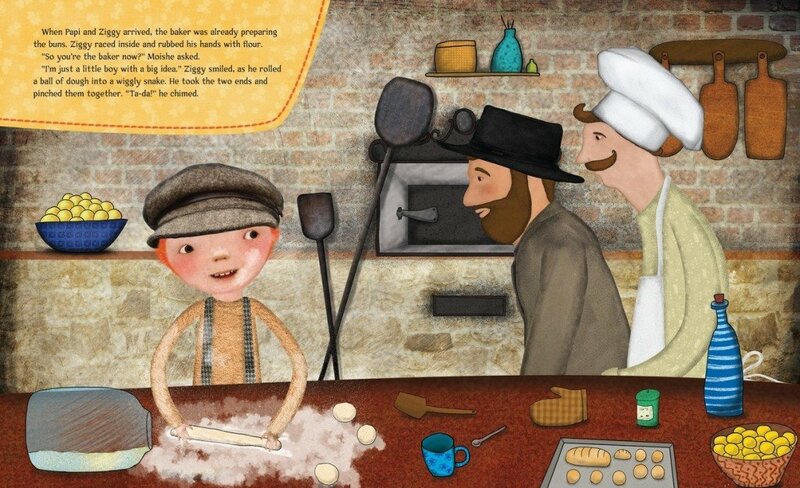 Just read about Rabbi Levi and the “shulstilts” that Ziggy made so that the Rabbi can “see the congregation over the bimah.” Ziggy’s father works in the bakery. So when the baker’s customers complain that “the buns are undercooked at the center,” Ziggy is determined to help! Will he be of use or just get in the way? Interior spread from Ziggy’s BIG Idea by Ilana Long with illustrations by Rasa Joni, Kar-Ben Publishing, ©2014. Visit www.karben.com for up-to-date details on highly reviewed and award winning titles from Kar-Ben Publishing and visit ebooks.karben.com to purchase and instantly download Kar-Ben books! I have to read this one!! It is perfect for my children’s cooking and recipe section! I do have a killer Bagel recipe I’ve been making weekly over a year now 🙂 Thanks for the recommendation. Have never tried to make ’em myself! Just grew up devouring ’em on a weekly basis. Thanks for stopping by and commenting.